Your baby may be starting to behave more like a toddler if she is beginning to spend more of her time standing on her feet. And she feels more grown-up, too – she loves trying to help you around the house, and is a happy companion for you. At this age babies vary enormously in their physical achievement. 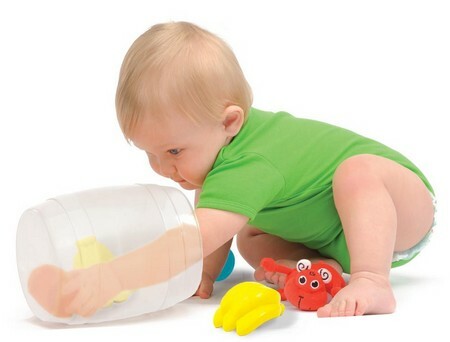 Some are crawling; others have just started to sit. Don’t worry if your baby is taking things slowly; she’ll do them in her own time. Your baby’s balance has improved tremendously. She can lean sideways while sitting without toppling over, and twist round to reach something behind her, enabling her to reach for things herself. By now, early crawlers are likely to be spending a lot of time up on their feet and cruising confidently. Your baby may even attempt to take her hands away from her support and try standing alone for a few seconds. Be prepared for bumps and bruises, and give her reassurance if she falls. Her first solo step will happen soon and, meanwhile, she’s working hard to perfect her balance and coordination. Now she is in her eleventh month, your baby is becoming more interested in how her toys move, fit together, or make noise. With her improved hand skills she can put objects where she chooses, so give her activities that will help improve these skills. Now she can easily let go of objects when she wants to, your baby will probably enjoy playing with a simple posting box. If she enjoys playing this simple game, you could then try cutting a square hole in a box and this time giving her a block for posting through the hole. This exercise will be harder than posting the ball. When she needs a new challenge, buy her a more complicated shape sorter to play with. As your baby learns to turn the pages of a book, make sure she has plenty of them to look at, especially board books. Encourage some regular quiet time together so that books become part of her everyday life. Establish her interest in the adult world with toys that mimic real objects, such as a toy telephone. Copying you is your baby’s first step towards fantasy, or imaginative, play and, by naming the objects she is playing with, you are helping her language skills too. Show your baby how you can build a tower using blocks, books, plastic bowls, or even plastic cups. She may not be able to build a tower with objects yet, but being able to knock them all down herself will give her such a great sense of power — and a real understanding of cause and effect.